The annual walk in support of Type 1 diabetes in Wetaskiwin included a skate as well this year. Held at the Drill Hall, supporters had their choice of either walking around the track at Norm Browne Field or skating laps at the Civic Centre rink. Most people chose walking instead of skating, which didn’t make much difference. 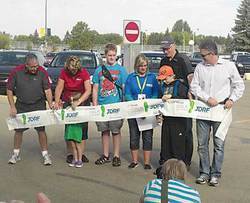 People were gathered together for one reason, to raise awareness and money for Juvenile Diabetes. Grade 7 student Tyson Fiveland was this year’s honorary Ambassador for the event. Registration for the walk/skate started at 9:30am this past Saturday with opening ceremonies commencing at 10. The opening featured master of ceremonies Cathy Fiveland welcoming and thanking everybody for coming out. Cathy was especially appreciative of her team of volunteers especially Tracy Normanbeau, Donna Elliot and Heather Rasmuson. Politicians Blaine Caulkins,Verlyn Olson and Mayor Bill Elliot were also on hand and made speeches. Once the speeches were made Ambassador Tyson Fiveland and 5 year old Tracy Normanbeau cut the ribbon and the walkers and skaters were off. Ambassador Tyson Fiveland all of 12 years of age, has Type 1diabetes. Tyson says he “tests his blood 10 times a day. Every time you eat you need to input how many carbs you just ate into your insulin pump. If you eat out you need to weigh and measure all your food”. Tyson’s Dad “gets up in the middle of the night to check on me”. Tyson was going to skate instead of walk on this day. Tyson is a hockey player and currently trying out as a first year Bantam. Tyson, like most kids his age, has a lot of energy which was obvious as he raced his friends around the ice while doing laps. Tracy Normanbeau’s 5 year old daughter Lainey faces the same obstacles. According to Tracy, “Every day is a challenge of routines. Kids don’t like getting poked or being on strict routines or being told what to eat. We hope to teach them awareness. You will never find a more responsible kid than a diabetes kid.” Grandpa Lance was there in support of his grand daughter Lainey, and out walking on his 84th birthday. On this day there were four teams with specially emblazoned t-shirts. Teams fund raised beforehand and there was a silent auction and barbequed hamburgers for everyone. All in all, it was a fun event for a good cause.